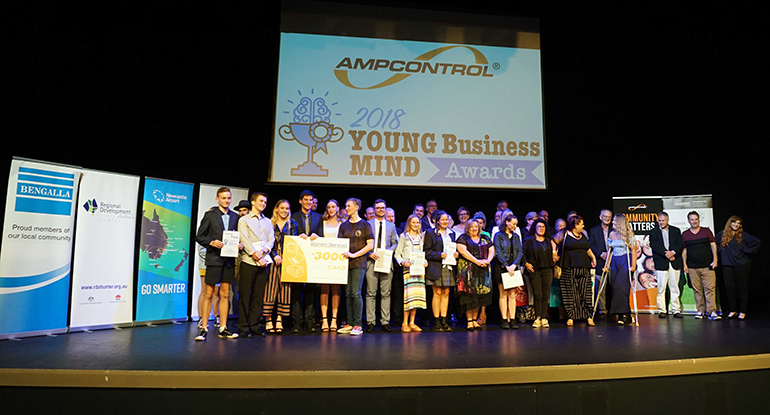 With a continued commitment to providing young people with access to STEM related career pathways, Ampcontrol proudly supported the Hunter Young Business Mind Awards on November 28. Now in its second year, the awards program encourages the region’s youngest innovators and entrepreneurs to pitch their ideas for a business, product, service or solution, with the prize money enabling each category winner to have their idea brought to life. “At Ampcontrol we’re passionate about creating a link between industry and the community, as we’ve already seen amazing things from the young people who’ve connected with us as part of our existing P-TECH and ME Program outreach activities,” said Leigh Stefanszyn, Ampcontrol General Manager – People and Engagement. The 2018 Ampcontrol Hunter Young Business Mind Awards included STEM, Young Indigenous Entrepreneur, Creative Industries, Social Enterprise categories and provided participants from year 5 – 12 to let their entrepreneurial and creative spirit soar. “Getting behind initiatives like the Hunter Young Business Mind Awards means we can help play a part in fostering the enthusiasm, courage and creativity it takes to develop something that is truly innovative. To see these characteristics in young people is amazing and something we are proud to support”, said Leigh. “We celebrate our 50th anniversary this year and one of our most enduring values has been innovation and an attitude of saying yes to challenges when other can’t. This has set us apart in business and to see so many young people with this same attitude, it is exciting to think what the future holds for these young innovators in the Hunter”, added Leigh. The 2018 Ampcontrol Hunter Young Business Mind Awards is an initiative of the Hunter Region Local Chambers of Commerce and the Hunter Futurepreneurs Program.